Oriente Import S.r.l. sale of oriental handicrafts articles, fancy goods, gifts, jewellery, clothing and fashion accessories - Oriente Import S.r.l. Cookie - The online shop using coockies, which provides safer and better quality online shopping. Click "OK" to increase your experience in this site. LONG AND LIGHT DRESS MADE OF VISCOSE, WITH SHORT SLEEVES AND ROUND NECKLINE.AVAILABLE IN FREE SIZE AND IN 3 DIFFERENT COLORS.MINIMAL ORDER QUANTITY 1 PCS. BIG SHOULDER BAG MADE OF COTTON, STONEWASHED WITH CUTS.EXPANDED BOTTOM 13 CM, WITH ZIP, SIZE 38X38 CM. 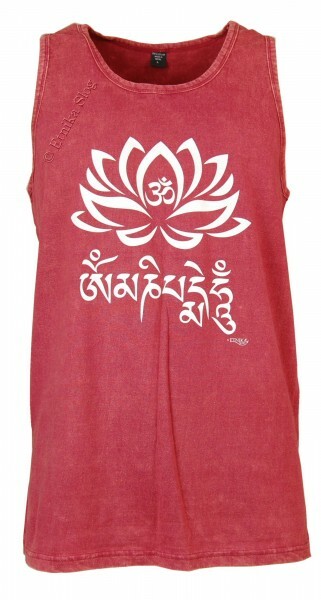 PRINT "HEMP OM"MINIMAL ORDER QUANTITY: 2 PCS - ASSORTED COLORS. SHORT SUMMER DRESS MADE OF VISCOSE, WITH TIGHT SHOULDER STRAPS.AVAILABLE IN FREE SIZE AND IN 5 DIFFERENT COLORS.MINIMAL ORDER QUANTITY 1 PCS. DRESS IN VISCOSE.AVAILABLE IN ONE SIZE AND 5 COLORS.MINIMUM QUANTITY 1 PIECE. WIDE-LEG TROUSERS MADE OF VISCOSE WITH EMBROIDRY AT WAISTAVAILABLE IN FREE SIZE AND IN 5 DIFFERENT COLORS. MINIMAL ORDER QUANTITY 1 PCS. TOP IN COTTON WITH ELASTANE.AVAILABLE FREE SIZE, VARIOUS COLORS.MINIMUM QUANTITY 1 PC. MINI SKIRT MADE OF COTTON, VISCOSE AND ELASTANE.SINGLE COLOR, AVAILABLE IN FREE SIZE AND IN 6 DIFFERENT COLORS. MINIMAL ORDER QUANTITY 1 PCS. WIDE LEG TROUSERS MADE OF VISCOESE. AVAILABLE IN FREE SIZE AND IN 5 DIFFERENT COLORS. MINIMAL ORDER QUANTITY 1 PCS. BIG SHOULDER BAG MADE OF COTTON, STONEWASHED WITH CUTS.EXPANDED BOTTOM 13 CM, WITH ZIP, SIZE 38X38 CM. PRINT "ETNIKA STYLE"MINIMAL ORDER QUANTITY: 2 PCS - ASSORTED COLORS. T-SHIRT MADE OF COTTON, VISCOSE AND ELASTANE, WITH SQUARE NECKLINE.AVAILABLE IN FREE SIZE AND IN VARIOUS COLORS.MINIMAL ORDER QUANTITY 1 PCS. TOP MADE OF VISCOSE WITH TIGHT SHOULDER STRAPS.AVAILABLE IN FREE SIZE AND IN 6 DIFFERENT COLORS.MINIMAL ORDER QUANTITY 1 PCS. WIDE LEG TROUSERS MADE OF VISCOSE, WITH ADJUSTABLE LACES AT WAIST.AVAILABLE IN FREE SIZE AND IN 4 DIFFERENT COLORS. MINIMAL ORDER QUANTITY 1 PCS. LONG DRESS MADE OF COTTON AND VISCOSE WITH ELASTIC BAND ON CHEST.IT CAN BE WORN ALSO LIKE A LONG SUMMER SKIRT.AVAILABLE IN FREE SIZE AND IN 5 DIFFERENT COLORS.MINIMAL ORDER QUANTITY 1 PCS. LIGHT TUNIC MADE OF VISCOSE, BUTTERFLY SLEEVES, V-NECKLINE AND LACES UNDER CHEST.AVAILABLE IN FREE SIZE AND IN 6 DIFFERENT COLORS.MINIMAL ORDER QUANTITY 1 PCS. SKIRT IN VISCOSE.AVAILABLE IN ONE SIZE AND 5 COLORS.MINIMUM QUANTITY 1 PIECE. DREAMCATCHER Ø CM 6 MINIMUM QUANTITY 3 PCS. TOP MADE OF VISCOSE WITH TIGHT SHOULDER STRAPS.AVAILABLE IN FREE SIZE AND IN 5 DIFFERENT COLORS.MINIMAL ORDER QUANTITY 1 PCS. KNEE LENGHT SKIRTS MADE OF COTTON, VISCOSE AND ELASTANE.SINGLE COLOR, AVAILABLE IN FREE SIZE AND IN 6 DIFFERENT COLORS.MINIMAL ORDER QUANTITY 1 PCS. COLLANA AMULETO TIBETANA IN CUOIO CON PENDENTE BUDDHA E CIONDOLI IN CUOIO CON PREGHIERA, LUNGHEZZA CM30. QUANTITA MIN 3PZ. AFGHAN TROUSERS MADE OF VISCOSE, WITH ELASTIC AT WAIST AND ANKLES.AVAILABLE IN FREE SIZE AND IN 6 DIFFERENT COLORS.MINIMAL ORDER QUANTITY 1 PCS. DREAMCATCHER Ø CM 6,5 - 5 MINIMUM QUANTITY 1 PCS. LIGHT SUMMER DRESS MADE OF VISCOSE, WITH ELASTIC BAND AT CHEST.IT CAN BE ALSO WORN LIKE A SKIRT.AVAILABLE IN FREE SIZE AND IN 6 DIFFERENT COLORS.MINIMAL ORDER QUANTITY 1 PCS. LIGHT SKIRT MADE OF VISCOSE, WITH ELASTIC BAND AT WAIST.IT CAN BE WORN ALSO LIKE A SHORT SUMMER DRESS.AVAILABLE IN FREE SIZE AND IN 6 DIFFERENT COLORS.MINIMAL ORDER QUANTITY 1 PCS. DREAMCATCHER Ø CM 11,5 - 6,5 MINIMUM QUANTITY 1 PCS. LONG AND LIGHT DRESS MADE OF VISCOSE, SLEEVELESS, ROUND NECKLINE.AVAILABLE IN FREE SIZE AND IN 6 DIFFERENT COLORS.MINIMAL ORDER QUANTITY 1 PCS. DREAMCATCHER Ø CM 6 MINIMUM QUANTITY 2 PCS. SHORTS, SHORT PANTS IN VISCOSE.WITH ELASTIC BAND IN THE WAIST.AVAILABLE IN FREE SIZE, 5 COLORS.MINIMUM QUANTITY 2 PCS. LONG AND LIGHT DRESS MADE OF VISCOSE, SLEEVELESS, ROUND NECKLINE.AVAILABLE IN FREE SIZE AND IN 5 DIFFERENT COLORS.MINIMAL ORDER QUANTITY 1 PCS. LONG SKIRT MADE OF COTTON AND VISCOSE WITH ELASTIC BAND AT WAIST.IT CAN BE WORN ALSO LIKE A LIGHT SUMMER DRESS.AVAILABLE IN FREE SIZE AND IN 5 DIFFERENT COLORS.MINIMAL ORDER QUANTITY 1 PCS. SHORTS, SHORT PANTS IN VISCOSE. WITH ELASTIC BAND IN THE WAIST. AVAILABLE IN FREE SIZE, 5 COLORS. LONG SKIRT MADE OF COTTON AND VISCOSE WITH ELASTIC BAND AT WAIST. IT CAN BE WORN ALSO LIKE A LIGHT SUMMER DRESS. AVAILABLE IN FREE SIZE AND IN 5 DIFFERENT COLORS. MINIMAL ORDER QUANTITY 1 PCS. WIDE LEG TROUSERS MADE OF VISCOESE. AFGHAN TROUSERS MADE OF VISCOSE, WITH ELASTIC AT WAIST AND ANKLES. AVAILABLE IN FREE SIZE AND IN 6 DIFFERENT COLORS. BOLERO IN VISCOSE WITH PRINTS. AVAILABLE IN VARIOUS COLORS, FREE SIZE. TOP MADE OF VISCOSE, WITH WIDER SHOULDER STRAPS AND SLIT ON THE BACK. 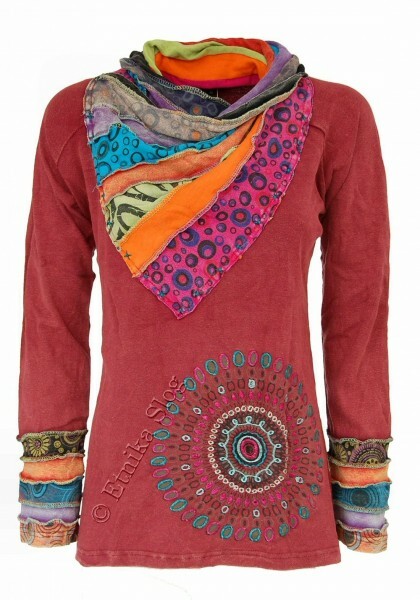 LIGHT TUNIC MADE OF VISCOSE, BUTTERFLY SLEEVES, V-NECKLINE AND LACES UNDER CHEST. LONG AND LIGHT DRESS MADE OF VISCOSE, WITH SHORT SLEEVES AND ROUND NECKLINE. AVAILABLE IN FREE SIZE AND IN 3 DIFFERENT COLORS. SHORT SUMMER DRESS MADE OF COTTON, VISCOSE AND ELASTANE WITH LACE AT THE BACK. 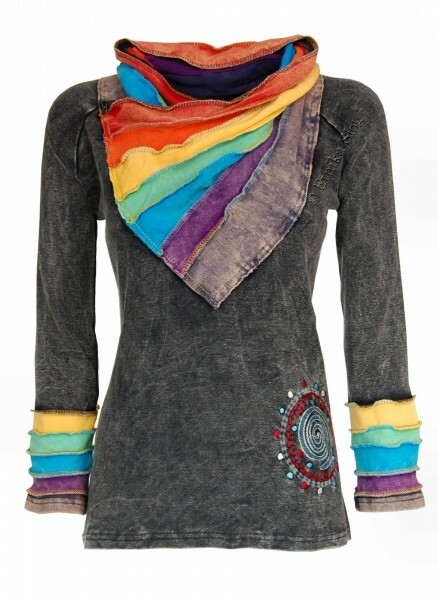 SHORT SUMMER DRESS MADE OF COTTON, VISCOSE AND ELASTANE, WITH TWO POCKETS AND MULTICOLOR NECKLINE. AVAILABLE IN FREE SIZE AND IN 3 DIFFERENT COLORS. KNEE LENGHT SKIRTS MADE OF COTTON, VISCOSE AND ELASTANE. SINGLE COLOR, AVAILABLE IN FREE SIZE AND IN 6 DIFFERENT COLORS. MINI SKIRT MADE OF COTTON, VISCOSE AND ELASTANE. 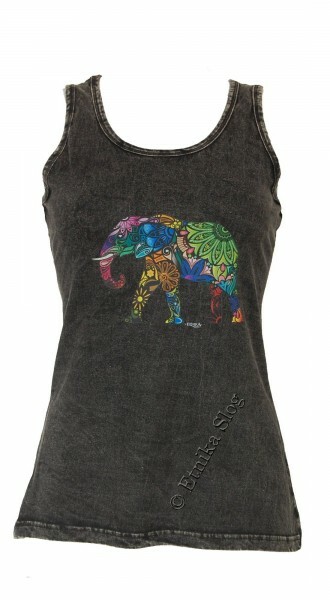 TOP IN COTTON WITH ELASTANE, V NECKLINE. AVAILABLE SIZES M - L, VARIOUS COLORS. 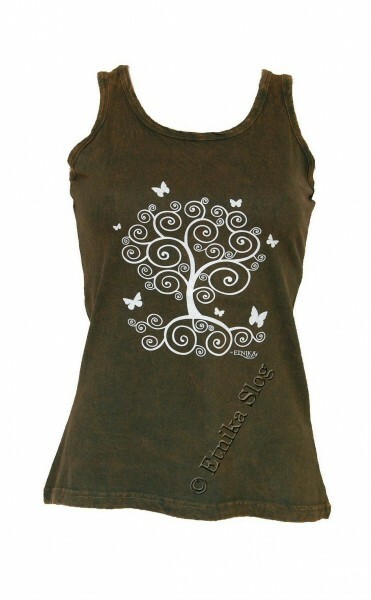 TOP MADE OF COTTON, VISCOSE AND ELASTANE, WITH LONGER BACK. AVAILABLE IN FREE SIZE AND IN VARIOUS COLORS. LONG AFGHAN TROUSERS, MADE OF COTTON, VISCOSE AND ELASTANE, ELASTIC WAISTBAND. AFGHAN TROUSERS MADE WITH COTTON, VISCOSE AND ELASTAN, ELASTIC WAISTBAND WITH LACES, SINGLE COLOR. AVAILABLE IN FREE SIZE AND IN 4 DIFFERENT COLORS. SHORT SUMMER DRESS MADE OF COTTON, VISCOSE AND ELASTAN, SLEEVELESS. IT CAN BE WORN ALSO LIKE A SKIRT. SUMMER SKIRT MADE OF COTTON, VISCOSE AND ELASTANE, WITH ELASTIC WAIST. IT CAN BE WORN ALSO LIKE A NICE SUMMER DRESS. BIG SHOULDER BAG MADE OF COTTON, STONEWASHED WITH CUTS. MINIMAL ORDER QUANTITY: 2 PCS - ASSORTED COLORS. 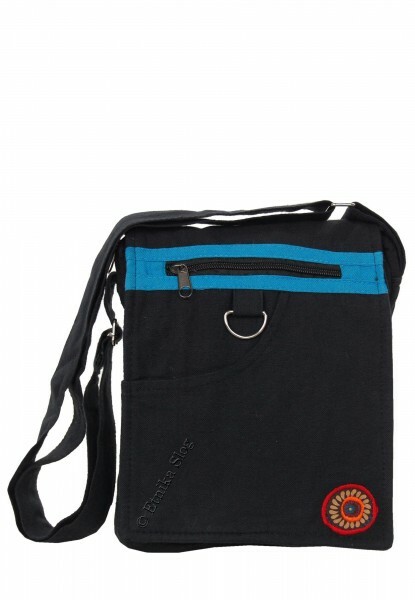 BAGGY SHOULDER BAG MADE OF COTTON, WITH TWO POCKETS AND CLOSING WITH ZIP AND COCONUT BUTTON. SINGLE COLOR WITH PRINT. MOTIVE HORUS EYE WITH MANDALA. BAGGY BACKPACK MADE OF COTTON, STONEWASHED. BAGGY BACKPACK MADE OF COTTON. DIMENSIONS 33X43 CM. PRINT WOODSTOCK. AVAILABLE IN FREE SIZE, WHITE. IT CAN BE WORN AS A SKIRT. LONG AFGHAN SKIRT MADE OF STONEWASHED COTTON. WITH 2 POCKETS AND SPIRAL EMBROIDERY. AVAILABLE IN FREE SIZE AND DIFFERENT COLORS. MINIMAL ORDER QUANTITY: 1 PCS. LONG AFGHAN SKIRT MADE OF COTTON, SINGLE COLOR WITH PRINTS. 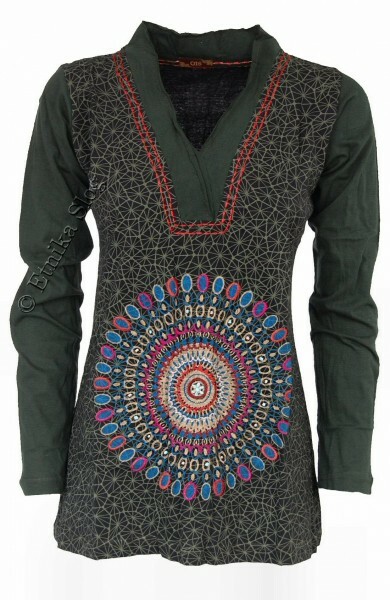 WITH 2 POCKETS WITH EMBROIDED 2 MANDALAS. AVAILABLE IN FREE SIZE AND 4 DIFFERENT COLORS. WIDE LEG TROUSERS MEDE OF NICE LIGHT COTTON, SINGLE COLOR. PAREO TROUSERS MADE OF IRIDESCENT COTTON, WITH TRANSVERSE STRAPS. BIG SHOULDER BAG MADE OF COTTON,WITH TURTLE EMBROIDED. BAG MEASURES: 37 X 35 CM, AVAILABLE IN DIFFERENT COLORS. SMALLER BAG MADE OF COTTON, SINGLE COLOR WITH EMBROIDERY. SWITCH AND ZIP. ADJUSTABLE SHOULDER STRAP. SET FOR BELLY DANCE; INCLUDES A TOP AND A PAREO WITH EMBROIDED MOTIVE OF BUTTERFLY. WITH BEEDS AND SEQUINS, MEDALLIONS IN SILVER COLOUR. AVAILABLE IN VARIOUS COLOURS AND FREE SIZE. SET FOR BELLY DANCE, INCLUDES TOP AND PAREO, CROCHET. PAREO SIZE: ON THE CLOUSURE 80 CM, WITH LACES 130 CM. BELLY DANCE SET, LARGE TOP, SHORT PAREO AND NECKLACE. IN RAYON WITH BEADS, FREE SIZE. BELLY DANCE SET, TOP - TROUSERS - ARM COVER - MASK. AVAILABLE IN COLOUR BLACK - LEAF PATTERN. AVAILABLE IN S-M-L IN 3 COLORS. SWEATER MADE OF COTTON, STONEWASHED WITH PATCHED COLLAR AND WRISTS. WITH EMBROIDERY AT ONE SIDE. AVALIABLE IN FOUR SIZES S-M-L-XL. T-SHIRT LONG SLEEVES MADE OF COTTON, WITH PRINTS AND STITCHING. 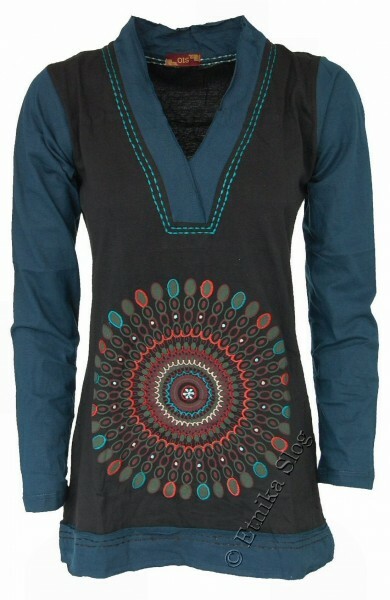 AVAILABLE IN SIZES S - M.
COMFORTABLE DRESS MADE OF LIGHT COTTON, WITH TWO POCKETS, SLEEVELESS AND ROUND NECKLINE. AVAILABLE IN 7 COLORS AND IN FREE SIZE. AVAILABLE IN 5 COLORS AND IN FREE SIZE. COMFORTABLE DRESS MADE OF JERSEY COTTON, WITH TWO POCKETS, SLEEVELESS AND ROUND NECKLINE. WITH EMBROIDERIES AT THE FRONT SIDE. COMFORTABLE DRESS MADE OF JERSEY COTTON, WITH TWO POCKETS, SLEEVELESS AND ROUND NECKLINE. UNICOLOR WITH EMBROIDERIES AND PRINTS. JACKET IN COTTON, WITH STONEWASHED STRIPES, OVERDYE. WITH A HOOD, POCKETS AND ZIP CLOSURE. PATCHWORK HOODIE IN STONEWASH COTTON, WITH HOOD AND POCKETS. AVAILABLE IN SIZES S - M - L - XL. 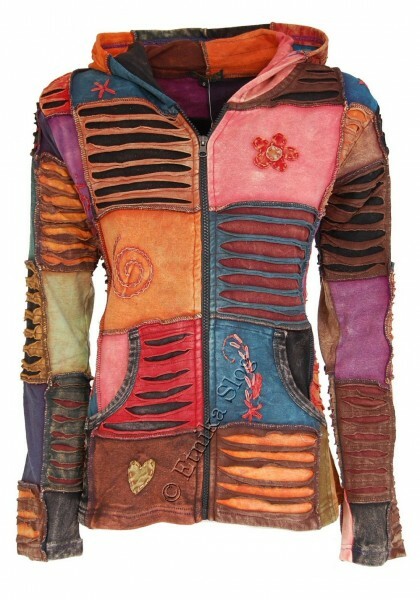 PATCHWORK HOODIE MADE OF STONEWASHES COTTON, WITH HOOD AND POCKETS. 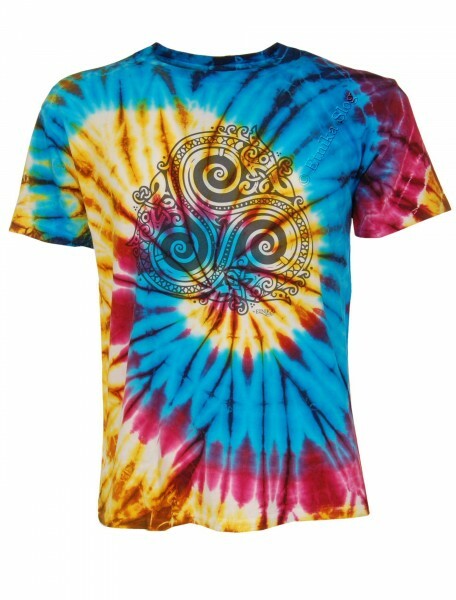 UNISEX T-SHIRT MADE OF COTTON, TIE DYE EFFECT. WITH ROUND NECKLINE. LIKE IN THE PICTURE - PRINT DRAGON TRISKELION. 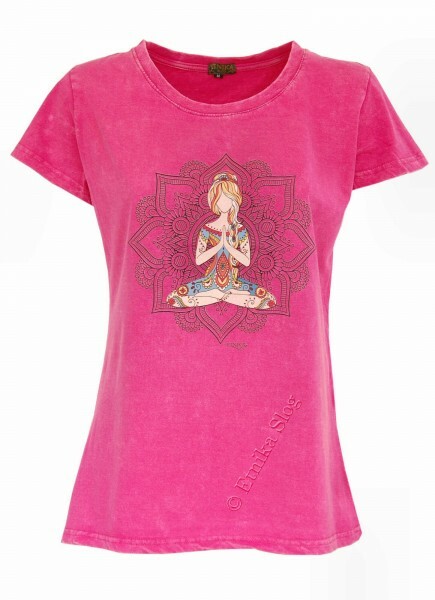 T-SHIRT MADE OF COTTON, STONEWASHED, WITH ROUND NECKLINE. UNICOLOR WITH PRINTED EYE OF HORUS. AVAILABLE IN DIFFERENT SIZES AND VARIOUS COLORS. 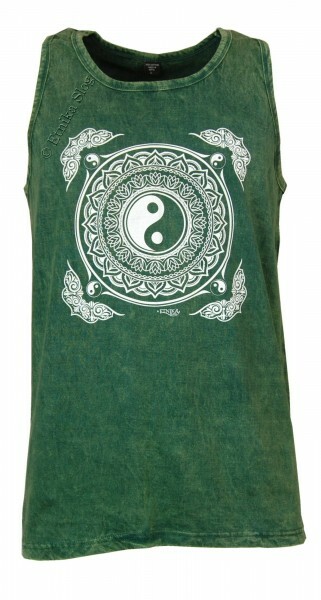 MEN TANK TOP MADE OF STONEWASHED COTTON. AVAILABLE IN THREE SIZES (M,L,XL) AND IN VARIOUS COLORS. AVAILABLE IN 3 SIZES (S - M - L) AND DIFFERENT COLORS. 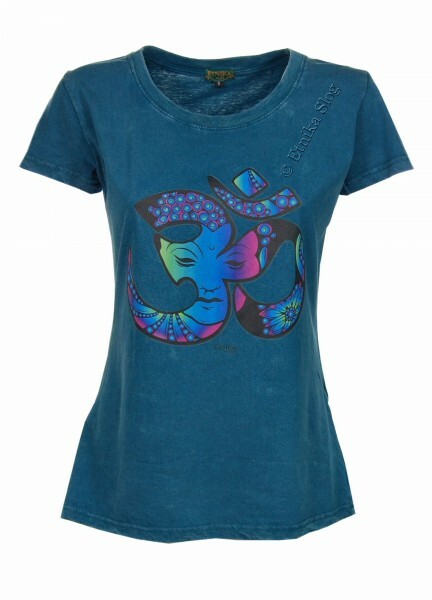 TOP MADE OF COTTON, STONEWASHED WITH PRINT ON THE FRONT, ROUNDED NECKLINE. AVAILABLE IN SIZES S - M - L IN VARIOUS COLORS.